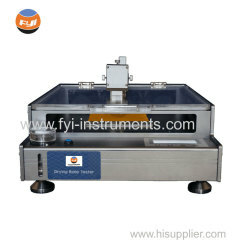 DW261A Automatic Drying Rate Tester is designed to determine the drying time and drying rate of a fabric automatically. It's suitable for testing and research of sportswear fabric and underwear apparel fabrics. It simulates the sweat drying process on the fabric. The specimen is exposed to a prescribed volume of water, while in contact with a heated plate maintained at 37°C (99°F), then use 1.5 m/s air to dry the specimen and the infrared temperature sensor test fabric temperature changes. When the fabric dry end, measure the drying time to obtain the drying rate. Note: this AATCC 201 Farbic Automatic Drying Rate Tester can conform to but not limit to the standards above, for more standards conformance, please contact us. 4 Test data are transmitted to the computer via Wi-Fi and displayed in the form of curves and graphs.